India holds all of the Siachen Glacier and its tributary glaciers. Operation Meghdoot (lit. "Operation Cloud Messenger" after a famous Sanskrit poem by Kalidasa) was the code-name for the Indian Armed Forces operation to capture the Siachen Glacier in the Kashmir region, precipitating the Siachen Conflict. Launched on 13 April 1984, this military operation was the first assault launched in the highest battlefield in the world. The military action resulted in Indian troops gaining control of the entire Siachen Glacier. Today, the Indian Army deployment to forward positions along what is known as the Actual Ground Position Line (AGPL) is also sometimes inaccurately referred to as Operation Meghdoot. Up to ten infantry battalions each of the Indian Army and Pakistani Army are actively deployed in altitudes up to 6,400 metres (21,000 ft). The Siachen Glacier became a bone of contention following a vague demarcation of territories in the Karachi Agreement of July 1949 which did not exactly specify who had authority over the Siachen Glacier area. Indian interpretation was that Pakistan territory extended only to about the Saltoro Ridge based on the Simla agreement where the territorial line's route after the last demarcated Point NJ9842 was "thence north to the glaciers." 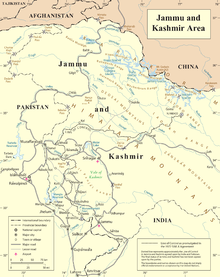 Pakistan interpretation was that their territory continued northeast from Point NJ9842 to the Karakoram Pass. As a result, both nations claimed the barren heights and the Siachen Glacier. In the 1970s and early 1980s, Pakistan permitted several mountaineering expeditions to climb the peaks in the Siachen region from the Pakistani side, perhaps in an attempt to reinforce their claim on the area as these expeditions received permits obtained from the Government of Pakistan and in many cases a liaison officer from the Pakistan army accompanied the teams. In 1978, the Indian Army also allowed mountaineering expeditions to the glacier, approaching from its side. The most notable one was the one launched by Colonel Narinder "Bull" Kumar of the Indian Army, who led an expedition to Teram Kangri, along with medical officer Captain A.V.S. Gupta. The Indian Air Force provided valuable support to this expedition in 1978 through logistic support and supply of fresh rations. The first air landing on the glacier was carried out on 6 October 1978 when two casualties were evacuated from the Advance Base Camp in a Chetak helicopter by Sqn Ldr Monga and Flying Officer Manmohan Bahadur. Contention over the glacier was aggravated by these expeditions, through both sides asserting their claims. Notably, when Pakistan gave permission to a Japanese expedition to scale an important peak (Rimo I) in 1984, it further fueled the suspicion of the Indian Government of Pakistani attempts to legitimize their claim. The peak, located east of the Siachen Glacier, also overlooks the northwestern areas of the Aksai Chin area which is occupied by China but claimed by India. The Indian military believed that such an expedition could further a link for a trade route from the northeastern (Chinese) to the southwestern (Pakistani) side of the Karakoram Range and eventually provide a strategic, if not tactical, advantage to the Pakistani Armed Forces. The Indian military decided to deploy troops from Northern Ladakh region as well as some paramilitary forces to the glacier area. Most of the troops had been acclimatized to the extremities of the glacier through a training expedition to Antarctica in 1982 before eventually launching the operation to occupy complete glacier. In 1983, Pakistani generals decided to stake their claim through troop deployments to the Siachen glacier. After analysing the Indian Army's mountaineering expeditions, they feared that India might capture key ridges and passes near the glacier, and decided to send their own troops first. Islamabad ordered Arctic-weather gear from a London supplier, unaware that the same supplier provided outfits to the Indians. The Indians were informed about this development and initiated their own plan, providing them with a head start. The Indian Army planned an operation to control the glacier by 13 April 1984, to preempt the Pakistani Army by about 4 days, as intelligence had reported that the Pakistani operation planned to occupy the glacier by 17 April. Named for the divine cloud messenger, Meghaduta, from the 4th century AD Sanskrit play by Kalidasa, Operation Meghdoot was led by Lieutenant General Prem Nath Hoon. The task of occupying the Saltoro ridge was given to 26 Sector, commanded by Brigadier Vijay Channa, who was tasked with launching the operation between April 10 and 30. He chose April 13, supposedly an unlucky date, because it was the Vaisakhi day, when the Pakistanis would be least expecting the Indians to launch an operation. Preparations for Operation Meghdoot started with the airlift of Indian Army soldiers by the Indian Air Force (IAF). The IAF used Il-76, An-12 and An-32 to transport stores and troops as well to airdrop supplies to high altitude airfields. From there Mi-17, Mi-8 and HAL Chetak helicopters carried provisions and personnel to the east of the hitherto unscaled peaks. The first phase of the operation began in March 1984 with the march on foot to the eastern base of the glacier. A full battalion of the Kumaon Regiment and units from the Ladakh Scouts, marched with full battle packs through an ice-bound Zoji La pass for days. The units under the command of Lieutenant-Colonel (later Brigadier) D. K. Khanna were moved on foot to avoid detection of large troop movements by Pakistani radars. The first unit to establish position on the heights of the glacier was led by Major (later Lieutenant-Colonel) R. S. Sandhu. The next unit led by Captain Sanjay Kulkarni secured Bilafond La. The remaining forward deployment units then marched and climbed for four days under the command of Captain P. V. Yadav to secure the remaining heights of the Saltoro Ridge. By April 13, approximately 300 Indian troops were dug into the critical peaks and passes of the glacier. By the time Pakistan troops managed to get into the immediate area, they found that the Indian troops had controlled all three major mountain passes of Sia La, Bilafond La, and by 1987 Gyong La and all the commanding heights of the Saltoro Ridge west of the Siachen Glacier. Handicapped by the altitude and the limited time, Pakistan could only manage to control the Saltoro Ridge's western slopes and foothills despite the fact that Pakistan possessed more ground accessible routes to the area, unlike Indian access which was largely reliant on air drops for supplies due to the steeper eastern side of the glacier. In his memoirs, former Pakistani president, General Pervez Musharraf states that Pakistan lost 985.71 sq mi (2,553.0 km2) of territory. Time magazine also states that the Indian advance captured 985.71 sq mi (2,553.0 km2) of territory claimed by Pakistan. Camps were soon converted to permanent posts by both countries. The number of casualties on both sides during this particular operation is not known. There are divergent views on the strategic value of the operation. Some[who?] view it as a futile capture of non-strategic land which antagonized relations between India and Pakistan. Others[who?] consider the operation to be a "daring" success by the Indian Military and ensured that the Indian military held tactical high ground on the strategic Saltoro Ridge just west of the glacier, albeit at a high cost. The Indian Army currently controls all of the 70 kilometres (43 mi) long Siachen Glacier and all of its tributary glaciers, as well as the three main passes of the Saltoro Ridge immediately west of the glacier, Sia La, Bilafond La, and Gyong La, thus holding onto the tactical advantage of high ground. The operation and the continued cost of maintaining logistics to the area is a major drain on both militaries. Pakistan launched an all out assault in 1987 and again in 1989 to capture the ridge and passes held by India. The first assault was headed by then-Brigadier-General Pervez Musharraf (later President of Pakistan) and initially managed to capture a few high points before being pushed back. Later the same year, Pakistan lost at least one major Pakistani post, the "Quaid", which came under Indian control as Bana Post, in recognition of Bana Singh who launched a daring daylight attack, codenamed Operation Rajiv, after climbing 1,500 ft (460 m) of ice cliff. Bana Singh was awarded the Param Vir Chakra (PVC) — the highest gallantry award of India for the assault that captured the post. Bana Post is the highest battlefield post in the world today at a height of 22,143 feet (6,749 m) above sea level. The second assault in 1989 was also unsuccessful as the ground positions did not change. The loss of most of the Siachen area and the subsequent unsuccessful military forays prompted Benazir Bhutto to taunt Zia ul Haq that he should wear a burqa as he had lost his manliness. No reliable data is available. However, both sides incurred most of their casualties from the weather and the terrain. A large number of soldiers from both sides suffered frostbite and high altitude sickness or were lost in avalanches or crevasses during patrols. In Siachen Glacier Operation Meghdoot, from 1984 till 18.11.2016, 35 Officers and 887 JCOs / ORs have lost their lives.This information was given by Minister of State for Defence Dr. Subhash Bhamre in a written reply to Majeed Memon in Rajya Sabha. Operation Meghdoot: How India Captured Siachen (Battle Ops) (2018) is a TV documentary which premièred on Veer by Discovery Channel series, Battle Ops. ^ a b NOORANI, A.G. (10 March 2006). "For the first time, the leaders of India and Pakistan seem close to finding a solution to the Kashmir problem". for a detailed, current map. Retrieved 29 April 2012. ^ "Indians have been able to hold on to the tactical advantage of the high ground. Most of India's many outposts are west of the (Siachen) Glacier along the Saltoro Range. Bearak, Barry (23 May 1999). "THE COLDEST WAR; Frozen in Fury on the Roof of the World". The New York Times. Retrieved 20 February 2009. ^ In an academic study with detailed maps and satellite images, co-authored by brigadiers from both the Pakistani and Indian military, pages 16 and 27: "Since 1984, the Indian army has been in physical possession of most of the heights on the Saltoro Range west of the Siachen Glacier, while the Pakistan army has held posts at lower elevations of western slopes of the spurs emanating from the Saltoro ridgeline. The Indian army has secured its position on the ridgeline." Hakeem, Asad; Gurmeet Kanwal; Michael Vannoni; Gaurav Rajen (1 September 2007). "Demilitarization of the Siachen Conflict Zone" (PDF). Sandia Report. Sandia National Laboratories, Albuquerque, NM, USA. Archived from the original (PDF) on 17 April 2012. Retrieved 20 February 2009. ^ a b "War at the Top of the World". Time.com. 7 November 2005. ^ "19 Interesting Facts About RAW". India Facts. 21 September 2016. Retrieved 3 January 2017. ^ a b c "War at the Top of the World". Time Magazine. 4 July 2005. Retrieved 30 December 2011. ^ a b "Operation Meghdoot". Indian Army. ^ Baghel, Ravi; Nusser, Marcus (17 June 2015). "Securing the heights; The vertical dimension of the Siachen conflict between India and Pakistan in the Eastern Karakoram". Political Geography. Elsevier. 48: 24–36. doi:10.1016/j.polgeo.2015.05.001. Retrieved 23 September 2016. ^ Wirsing, Robert. Pakistan's security under Zia, 1977-1988: the policy imperatives of a peripheral Asian state. Palgrave Macmillan, 1991. ISBN 978-0-312-06067-1. ^ Desmond, Edward W. (31 July 1989). "The Himalayas War at the Top Of the World". Retrieved 15 December 2017 – via www.time.com. ^ "Project Hope". Rediff. 25 January 2001. Retrieved 30 December 2011. ^ "Confrontation at Siachen, 26 June 1987". Bharat Rakshak. Archived from the original on 24 February 2014. Retrieved 30 December 2011. ^ "Demilitarisation of Siachin by Air Marshal [R] Ayaz A Khan". Retrieved 15 December 2017. ^ Parminder, Kaur (29 October 2016). "Siachen Glacier Operation Meghdoot Takes 922 Lives". ABC Live. ABC Live. Retrieved 30 November 2016. ^ "Operation Meghdoot: How India Captured Siachen Battle Ops". Veer by Discovery. Retrieved 22 April 2018. War at the top of the World - Article in TIME.